40 Super Hot is a popular casino slot machine developed by EGT Slots. As the name of the 40 Super Hot game presumes, fruits are the theme of the game. With a fantastic abundance of juicy and colorful fruits such as plums, cherries, oranges, grapes, lemons, and melons, as well as an attractive music accompaniment, the game is definitely thrilling. Besides these crisply-colored fruits, that appear especially sharp on the dark background, the big wins, too, make the game fantastic! Whenever the player hits a score, he can enjoy flames bursting and filling the atmosphere around with excitement! Play the forty-payline game online on your device (even mobile) without the need to download it. 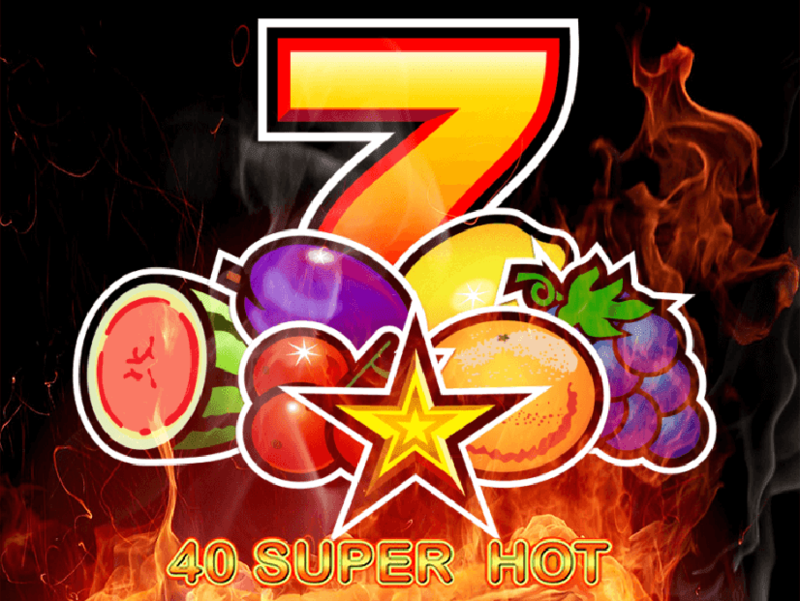 As the theme of the game 40 Super Hot is fruits, it is filled with respective symbols. The most “profitable” symbol is the grape. Collecting five features of grapes, the player wins the highest amount – 400 coins! Plums and melons are quite beneficial, too. Both of these features bring 200 coins to the player when he collects five of identical symbols – either melons or plums. Collecting five cherries, oranges or lemons, meanwhile, the player receives 100 coins. The bright red 7 is the Wild symbol of the slots. It brings winning combos while if the player succeeds collecting five 7s, he/she will get as much as 1000 coins! Anyway, if the gambler manages only three or four of it, an impressive reward will still be achieved. The most powerful symbol of 40 Super Hot is the Scatter. It is pictured via a bright yellow Star. Five Stars will bring an astounding amount of coins – 20, 000! Surely, the player can expect big wins for four or even three stars, too. 40 Super Hot offers to double your win by guessing the right color red or black. However, if you fail and choose the wrong color, you are going to lose the amount of your gambling. The Progressive Jackpot Prizes offered after the end of the game have the might to make the player significantly wealthier than before the game. All that you need is to guess three of the same suit cards from twelve ones. This is the fourth level of the bonus game, however. The first three levels presume to get a Club (the first prize), a Diamond (the second prize), and Hearts (the third prize). The minimal gambling amount is 1.00, i.e. 40 credits. Hence, the maximum wager for all forty lines together is 800 credits! Making such a bet, the player gets an access to the BIG money prize. If you plan to spend the upcoming several hours on 40 Super Hot casino slot machine, you are welcome to the best online platform! We are welcoming as skillful players so beginners. Play free to get some practice before gambling on the real money! With our safe money transaction system, your funds (both deposits and payouts) are 100% safe!